Welcome to 'Love It or Toss It?' Round 3. This is the brainchild of the lovely Bronzer Bunny and Gummy, who have done a number of installments themselves and recruited a number of other beauty addicts (including myself) to join in with them. The idea of 'Love It or Toss It' is to take a few products that I've been neglecting for far, far too long and take them for a test drive, after which they either make the cut and stay in my collection or get tossed out/given to friends/added to my blogsale. Lately, I've been in the mood to pare down my makeup collection to only products that I absolutely love, so I'm afraid that I've been quite ruthless in this installment. Benefit Bella Bamba Blush: Bella Bamba, which has sadly been discontinued by Benefit, is a mid-tone pink with gold shimmer throughout. I absolutely loved this blush when I first got it many moons ago, but it has fallen to the wayside as more sophisticated blushes have distracted me with their beauty. But Bella Bamba is supremely flattering and deserves another look. This one gets a KEEP. Revlon Colorburst Lipgloss in Strawberry: The Revlon Colorburst Lipglosses are some of the best drugstore lipglosses. Strawberry is exactly what it says on the tin: a warm strawberry shade. It is nice, but nothing extraordinary. And given the ridiculous number of lipglosses I have in my collection, this just doesn't stand out enough to be kept. So, sadly it earns a TOSS. Dior Serum de Rouge in 650 Peach Serum and 660 Garnet: Dior launched the Serum de Rouges back in 2009, but these are a product I have literally never seen anyone blog about. They are a highly glossy lipstick formula that almost melts into the lips. These feel very moisturizing on the lips and I lik both of the colors, but I rarely reach for them. Given that the two shades I own are very close, I feel like I should KEEP one (because I love them) and TOSS one (because I have too many lip products!) So, in the end 660 Garnet is on the chopping block and is getting the heave ho. 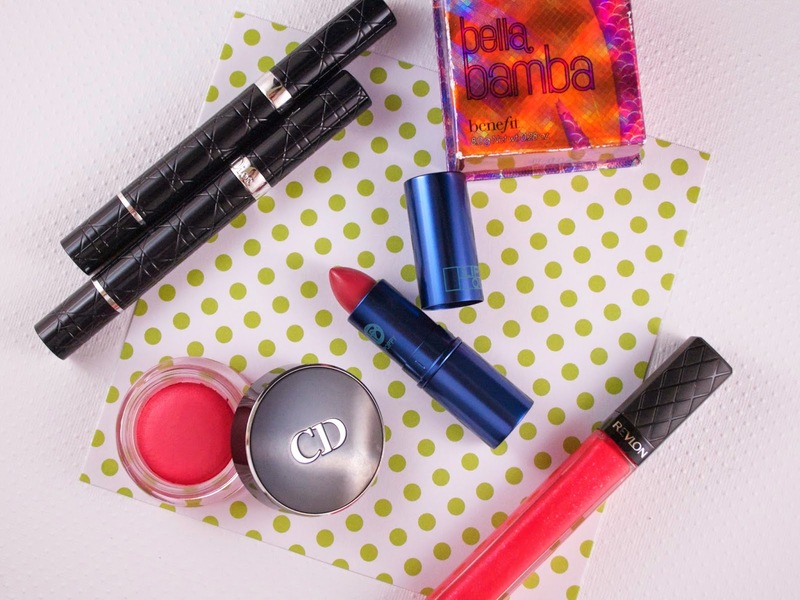 But do check out these formulas if you are looking for an easy to wear, moisturizing, glossy lip! Lipstick Queen Jean Queen: Jean Queen is meant to be an everyday, wearable shade that allegedly suits every woman on the planet. It is a beautiful, semi-sheer, high shine 'MLBB' shade. Sadly, though, I've decided that I'm going to let go of Jean Queen. It's nothing against the color or the formula (I think Lipstick Queen as a brand is brilliant! ), but I have fairly pigmented, mauvey lips and I've realized that when I am wearing Lipstick Queen it looks exactly the same as when I am wearing Carmex. Thus, I am going to capitalize on my current minimalist urges and TOSS. Dior Diorblush Cheek Creme in 871 Bikini: Bikini is a bright watermelon shade and it feels exceptionally silky at first touch. It blends in to the skin well, but the formula just doesn't hold up to my super oily skin. And while the shade is beautiful, it isn't particularly unique. It earns a TOSS. If you are looking for a bright, long lasting, non-powder blush formula, look at the Josie Maran Watercolor Cheek Gelées. The shade Pink Escape is particularly gorgeous. Final tally here is KEEP: 2 and TOSS: 4. How do you go about deciding which products to purge from your collection? Do you ever have regrets? And come find me on Bloglovin, Twitter, and Instagram!